The Ottawa River will swell during the pole shift, and not return to it's former size. During the stretching of the Atlantic that occurs during the pole shift, and consequent widening of the St. Lawrence Seaway, Ottawa will also be stretched, with the result that the Ottawa River will become ocean, saltwater, and the two halves of Ottawa separated. Where this will not be the case in the northern region, this will go under water shortly so the separation by water will seem complete. 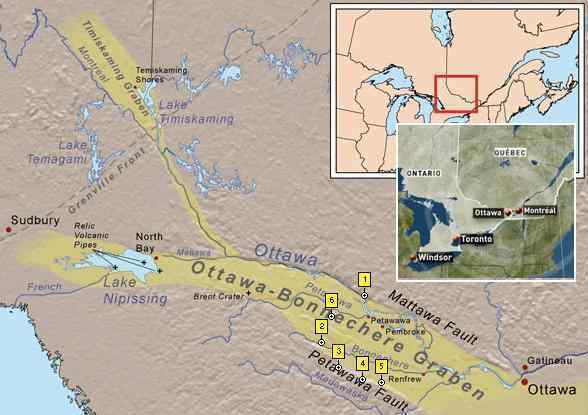 The land close to Ottawa, the city, will ride high, and be relatively secure from the havoc from earthquakes and volcanoes that rack some other parts of the world along fault lines. Plan on fishing as a source of food, in the main, during the Aftertime. We have stated that the Ottawa River will split open during the pole shift, separating the part of Ottawa on either side of the river in the process. This split is, of course, along the existing fault line that runs under the river, where the rock is already pulling apart. This will not occur until the pole shift, will not rip during the New Madrid adjustment expected during the 7 of 10 scenarios. We have described the trauma that cities along the Seaway will experience, during the new Madrid adjustment and beyond, as devastating as regards earthquake shaking but not as regards inundation. Cities to the south of the Seaway such as Cleveland, Toledo, and Buffalo will be shattered during the 7 of 10 New Madrid adjustment, but the pinch in the Seaway where the Seaway opens into Lake Ontario will not split during the 7 of 10. And even though the Seaway will split open at the pinch during the pole shift, Montreal just north of this pinch will survive, although shattered by earthquakes. Niagara Falls will likewise not split open until the pole shift itself.